When my Pediatrician began to discuss introducing solids with me, the SLP in me started to get VERY excited. I mean, abnormally psyched to puree things. Going into it I knew my daughter wasn't going to just open her mouth and willingly start eating. What I didn't realize was how obsessed she would become with holding her own spoon and attempting to feed herself. In my quest to find something she could use I stumbled upon NumNum "Gootensils". The slogan is "when it's too soon to spoon" - so cute. They were created to increase utensil usage, geared towards babies that are eager to learn and use a spoon. Flat, short, and stubby which makes them perfect for tiny hands. 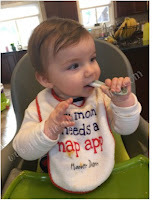 the handle and "spoon" part itself are both textured, which makes it nice for baby to chew on when teething. Feeding time began to be an epic battle of wills regarding the spoon. My daughter desperately wanted to hold the spoon and feed herself. This led to her practically clawing at the spoon before I could get any food into her mouth, or grabbing the spoon and not letting go. Eventually I let her try the spoon while watching her like a hawk. However, the spoons we were using (Boon) were long, which was great for me feeding her, but awful as a choking hazard during self-feeding. The design of the Boon spoons were also too thin for her to really grasp. Kameryn took to the gootensil instantly and really enjoyed biting it, playing with it, and eventually using it to eat. The flattened spoon helps me get more food into her versus on her (although blueberries continue to be a lost cause, that stuff goes EVERYWHERE), and she likes the textured feeling on her gums. Flattened head is great for self-feeding and guided feeding. 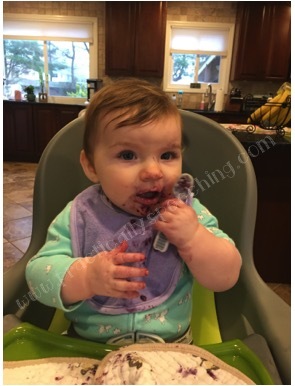 The textured handle makes it easy to hold onto as a parent -- even when covered in pureed food! The textured head actually encouraged my daughter to functionally use the spoon. 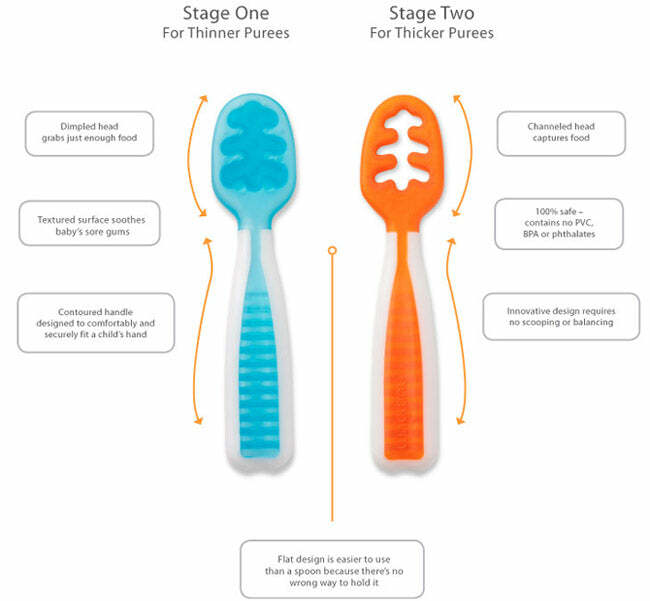 The two different spoons really do "catch" the different textures of food and hold onto it. Cost effective at $9.99 per set. Biting the handle of the spoon. Made EU-grade TPE and food-safe polypropylene. This sort of can't be helped - I just like to avoid plastic as much as possible. Imported - again, can't really be helped. Overall, this is a great product created by two parents who get it. It's priced correctly, easy to clean, and easy to use. I will definitely be trying out the bowl they have as well - blog post to come!